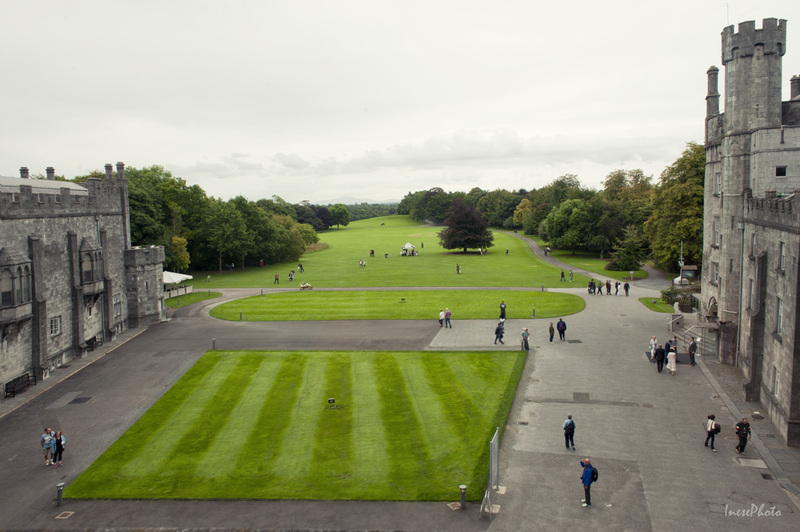 The opening picture was taken from Kilkenny Castle window this summer. Its extensive front lawn stretches for about half a mile and blends into the park. I have been there numerous times. Years ago you would see dozens of grey squirrels over there, but someone set traps and killed 75 squirrels just before my other pictures from this blog were taken. On that particular trip I only saw one squirrel munching on peanuts deeper in the park. 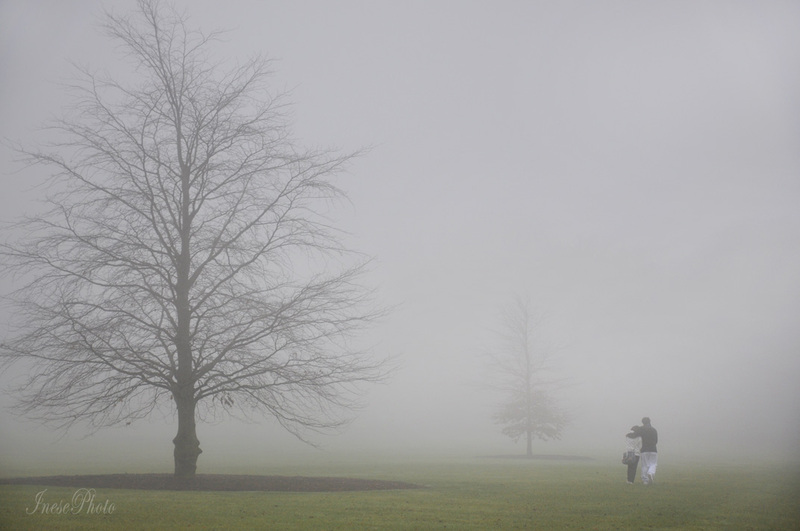 I took these pictures on two foggy days in January and November 2010. In January I went to see the Angels – Beacons of Hope exhibition created and coordinated by Dublin based artist Nollaig Fahy, and in November I went there frozen with grief after my friend’s funeral, all hope gone. You probably won’t find much information about these two events in the internet any more, so I decided to write a few words about the Angels. We need hope in 2017 as we did in 2010. 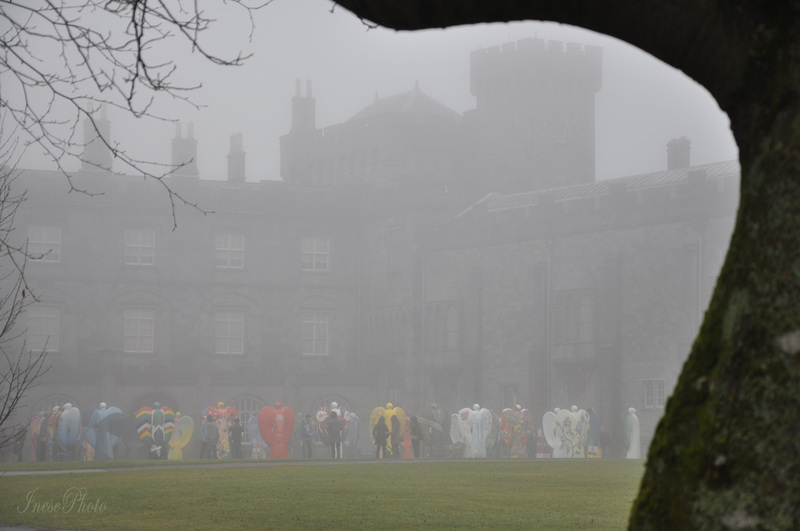 More than fifty colorful, eight foot tall angels lined the castle courtyard to bring the message of hope before they continued their nationwide tour. Made from a single mould they had been created to be a blank canvas. Invitations had been sent to a variety of artists, sport stars and other celebrities, some schools and prisons to paint an angel. For the general public the street angels were available so that people could leave a signature or a thumb imprint. 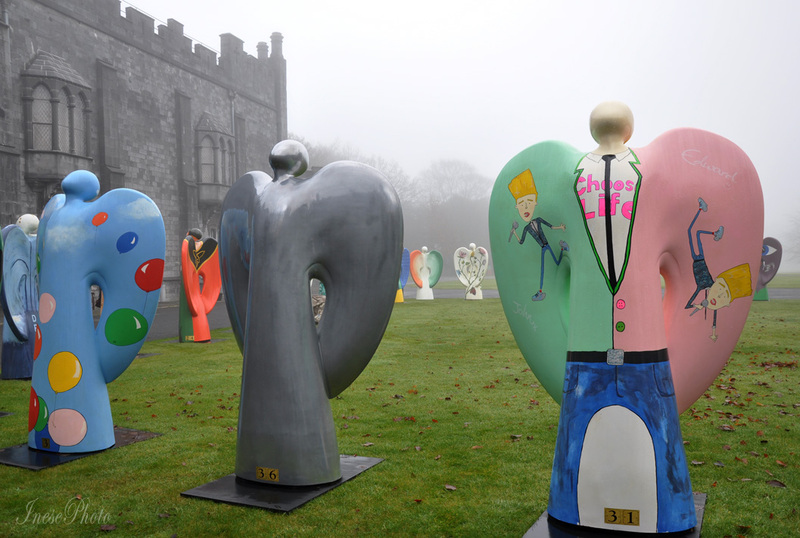 One of the angels in the picture below, the one with the Jedward brothers painted on it, was designed and painted by a freelance artist Sara Sheridan. She and her team painted some of the ‘big name’s’ angels. 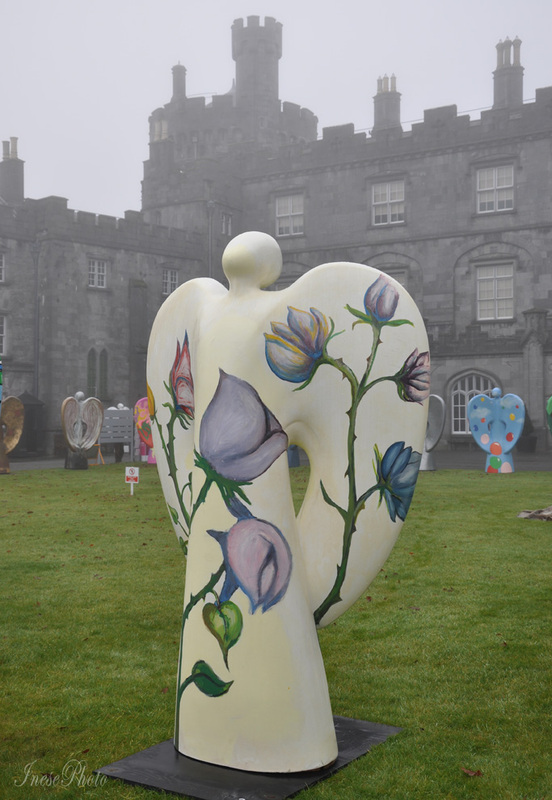 One of my favorites, the Rose of Hope angel was designed and painted by Irish fashion designer Lisa Fitzpatrick. Some other names that could be mentioned are Uma Thurman, The Edge, Irish novelist Neil Jordan, actors Brendan Gleeson, Colin Farrell and Cillian Murphy, comedian Des Bishop, broadcaster Ryan Tubridy, designer Budd Holden, professional golfer Padraig Harrington, rugby player Brian O’Driscoll and his colleague from Australia Rocky Elsom. This is a short video where Nollaig Fahy tells the story about the angel painted in a woman prison. 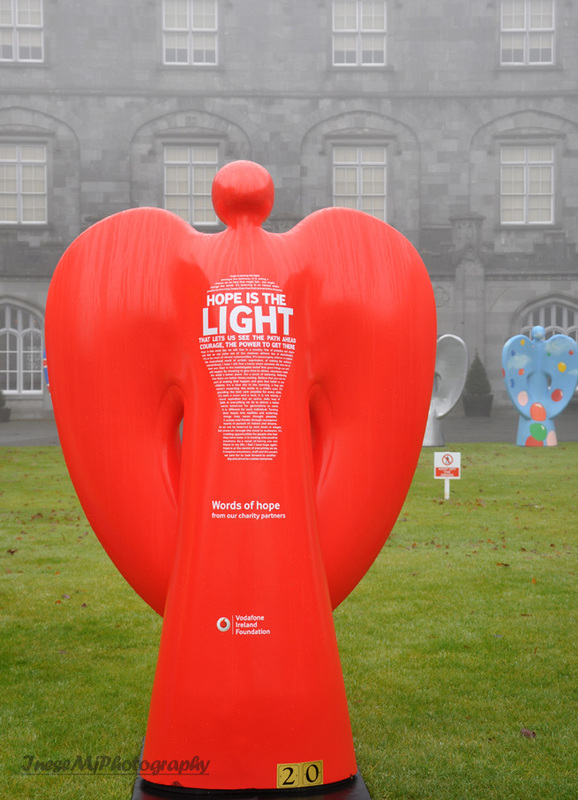 After they had toured around Ireland, the angels returned to Dublin for auction. 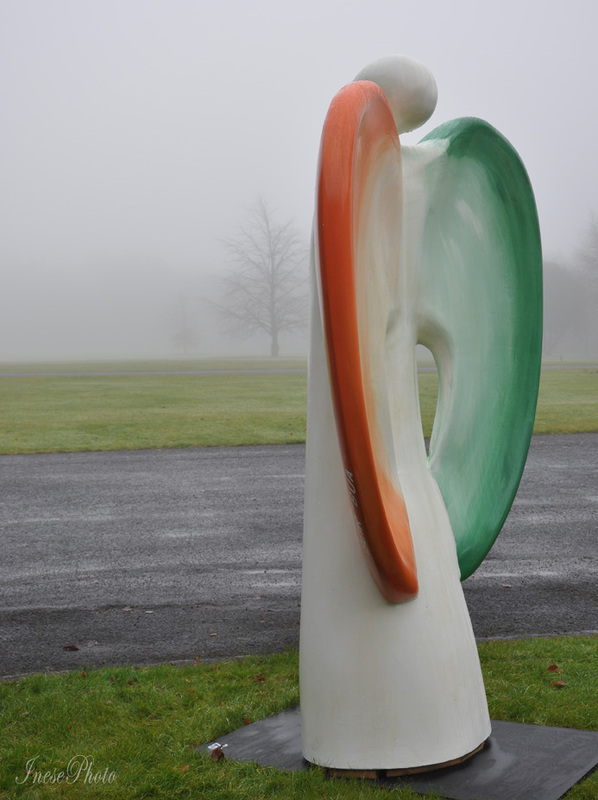 I have read that The Hope Springs Eternal angel designed and painted by Irish impressionist Gerard Byrne was purchased by Chris de Burgh and went to Glencree Centre for Reconciliation in Co Wicklow. I don’t know if all the angels were sold, and where the other angels are now. They are somewhere in the world anyway. I really would like to change the national conversation from one of doom and gloom to one of hope. “Paint your angel”, make the world brighter. Hope v Gloom – I put my bet on hope. Breathtaking photos! Each one is a meditation in itself. Your art magnifies the beauty of God’s creation. Thank you. Keep up the great work. Thank you, and sorry for the late reply. Haven’t been online lately. So beautiful. I hadn’t heard about them. Thanks, Irene! Some of them went to Wales I think. It was a great project. I love the message of this post and the words and images you have used to illustrate it. The angels are so beautiful and the message of hope shines fro each and every one. 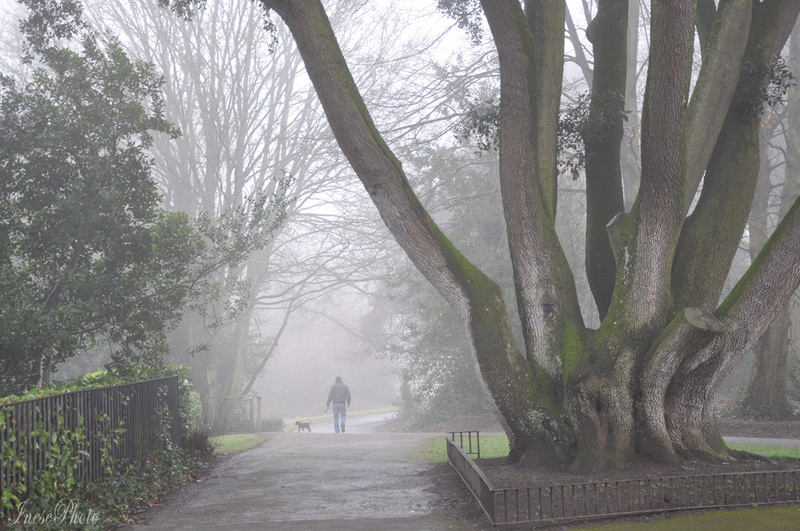 Wonderful photos of the angels and your ‘foggy’ photos are so atmospheric. Thank you so much! The fog was spectacular. It was a very cold day. I came to Kilkenny to meet up with a friend whom we buried later that year. How sad that must have been for you. But looking back on your visit to Kilkenny will always hold memories of the lovely time you spent together there. Beautiful blog post! Sad about the squirrels… but I love the pictures and all the angels! Nice of you to share! Lovely post, Inese. Sad about the squirrels though. “Hope,” sure is something we all need going into 2018. Let’s hope the beautiful angels bring us better times. I love them as a blank canvas. 🙂 🙂 So sorry about your friend. I paused at the name Kilkenny because some walking friends have family nearby and they’re there for Christmas. I hope 2018 is kind to you. Thank you so much! 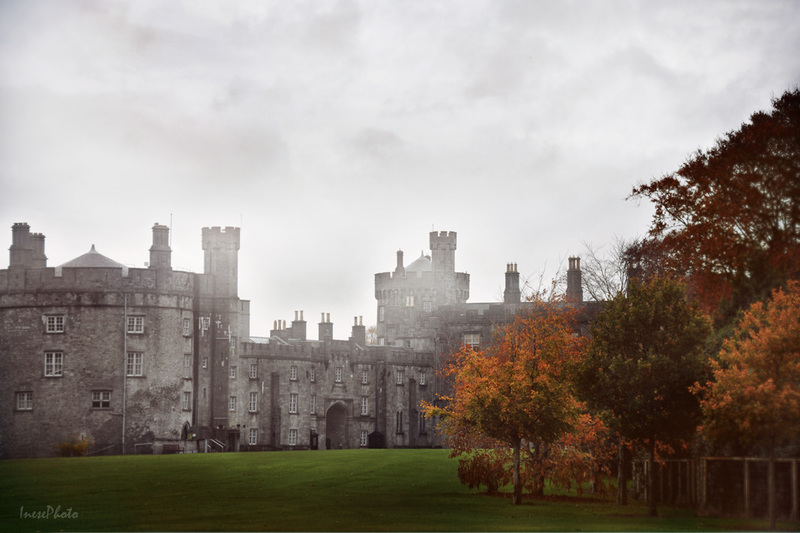 It is wonderful that your friends are visiting Kilkenny at this time of the year. The contrast of the angels colors against the fog is jaw-dropping, not to mention the realization: I was there! I was actually in this place once! Back when I visited Ireland for a few weeks of summer study, I managed to reach Kilkenney Castle! I didn’t have enough money to go inside, but I remember those grounds, and the power in the height of stone. So exciting! I am absolutely delighted that I posted something related to your memories. I will share some pictures later on. I haven’t been in the castle many years, and decided to visit again in July. They didn’t have guided tours and I enjoyed roaming the castle at my own pace. How wonderful that you are able to send the angels on a tour again, albeit virtual!! Another very unique blog. 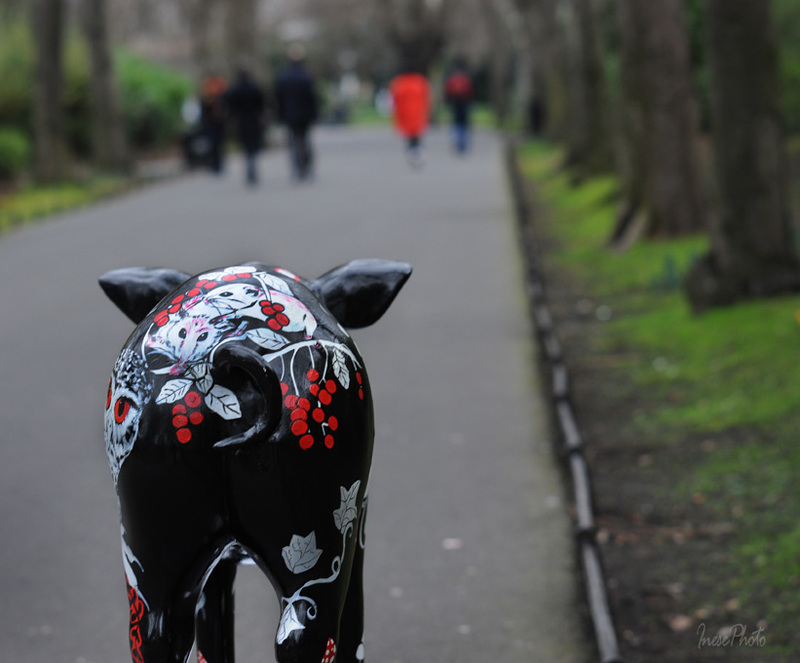 I wish I could have seen the Angels – it reminds me of the painted pigs throughout Bath in England when I visited a while ago. 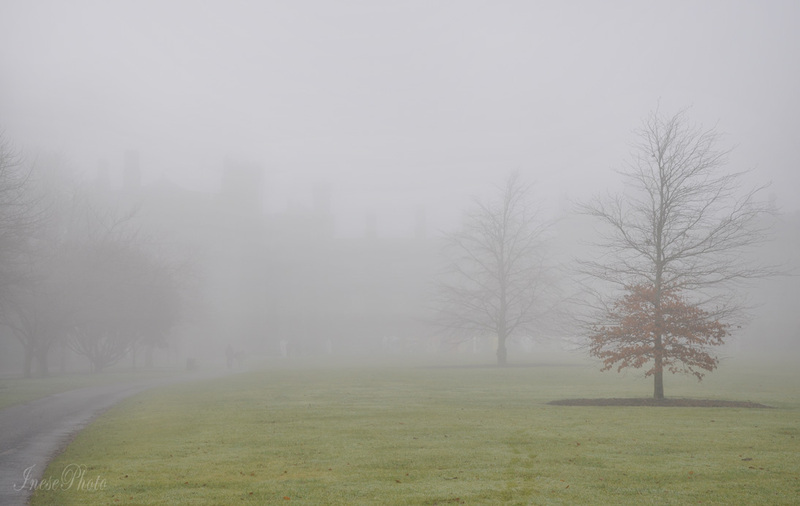 Loved the foggy images – I never seem to be in the right place to get this effect. Hope you feel better soon! Oh I remember the pigs. We had a good couple of them in Dublin. I will upload a picture. Then there were cows, before the pigs, all over Europe. Thank you 🙂 That’s hope. How unique and beautiful. Thanks for sharing, Inese. What a lovely message too. Beautiful, eerie photos that are transformed by the colourful angels. You have broached two subjects in the post. While your pen has dwelt on Angels of Hope, you have left it to pictures to speak about your bereavement. Fog is a powerful medium in able hands. Thank you so much! Both visits were meaningful, and both times there was fog. Was it a message for me to make a connection, to remember that festival of Hope and feel the light on my dark day? I don’t know. Fog is a translucent land between darkness and light. I guess it could release you either way depending on the cues you pick. Yes, I too think so. 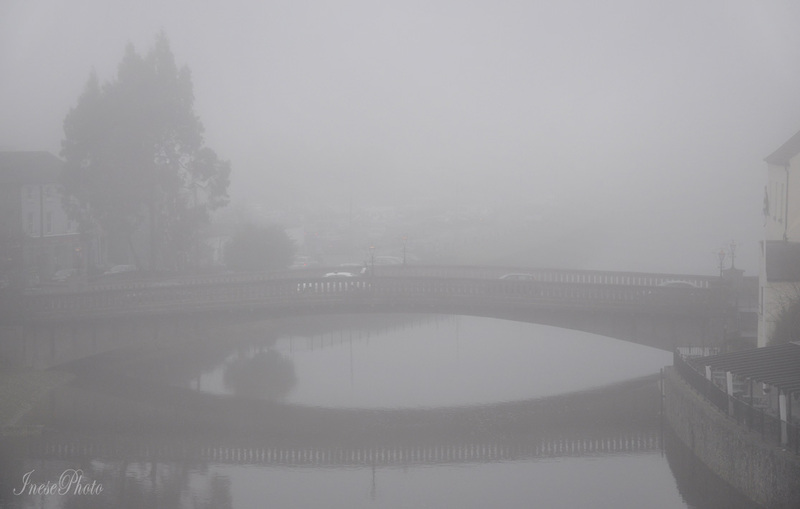 I compare the pictures from both trips – the fog is the same, my mood is different. I love the photo from the castle looking down across the grounds. Quite a view from up there! Thank you for this – I’m having an Angel kind of Christmas this year. I love the idea behind this and so agree that we need to focus on what is good in the world instead of what is bad. More angels required everywhere. P.S. I don’t get all the squirrel hate. just remove their food source and they high-tail it out of town to somewhere with better resources. It ain’t rocket science. This is a big park, but there are some private houses around. May be the squirrels were stealing fruit from their gardens? I don’t know who did it, but somehow the info leaked and got into the local paper, with the exact number of killed squirrels stated. Anyway, it was a horrible thing to do. They were a great joy to watch. Thank you! I just love the fact that these things unite people and make them softer and kinder to each other. Somebody should contact the guy, Nollaig Fahy. It would be so wonderful if the angels traveled around the world. They paint them, sell them for charity, and the person who bought one can donate it for their city, hospital or any other institution. Oh thank you, I will have a look right now! These are stunning! The fog makes the photos even more spiritual. Some days it seems that hope has deserted us…glad you found hope in your visit. I love this kind of art. Take care! Beautiful and very timely. Your images of the angels and the castle setting are lovely. Thank you so much! I like the way they are emerging from the fog. It was a chilly day, probably. Thank you for your beautiful comment, Mihran! Thank you for your beautiful comment, Rosaliene! The angels are beautiful. 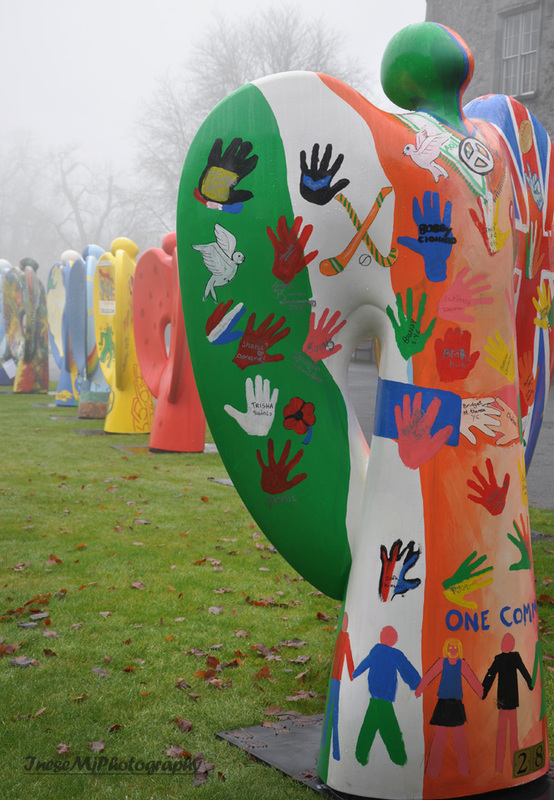 Our state just celebrated its 150th anniversary and a public art project with hearts was done to celebrate. Like with the angels, the wide variety of interpretations artists took was amazing. Isn’t it great that people can be united in doing something good. I wish we stayed united in spite of anything. George, neither did I 🙂 I am very careful with signing stuff 😉 Happy Christmas to you and your wonderful parents! Wow, this is awesome and so beautiful. Thank you for sharing it. Cheers! The angels are beautiful Inese and I like the idea with them. I don’t understand, why anyone should need to kill so many squirrels, this I find very sad. Let us wish to get a much better 2018, I agree. Our world go in chaos now and we can just hope the best. Thank you Irene! I see some good tendencies in society. I only wish we were more united instead of drifting apart racially, politically and all this sort of things. I too was very upset about the squirrels. I noticed they were gone and thought it happened because of some epidemic or some bad nuts people fed them. Then I googled and learned that they were killed. Fur? Punishment for stealing fruit and veg from gardens? I don’t know what the reason was. Love the fog. We are experiencing the fog as well. So mysterious when you walk in it. Back east the fog can get so thick that you don’t see ten feet in front of you. Makes for white knuckle driving. The angel of hopes are wonderful. What a great and wonderful idea to let people express themselves including writers, actors etc. Hopefully they change an angel of hope to an angel of confidence. Wonderful post. The fog can be dangerous indeed. When I was very young I almost got myself killed in the fog. A crazy farmer driving a horse drawn cart was probably returning from the bar, long after the midnight, and appeared out of nowhere right in front of me. I had two passengers and we were four hours on the road, one hour from home. How did I manage to avoid the collision, I still don’t know. My guess is that my Dad who had died just a couple of months before the event, guided my hand on the steer wheel. 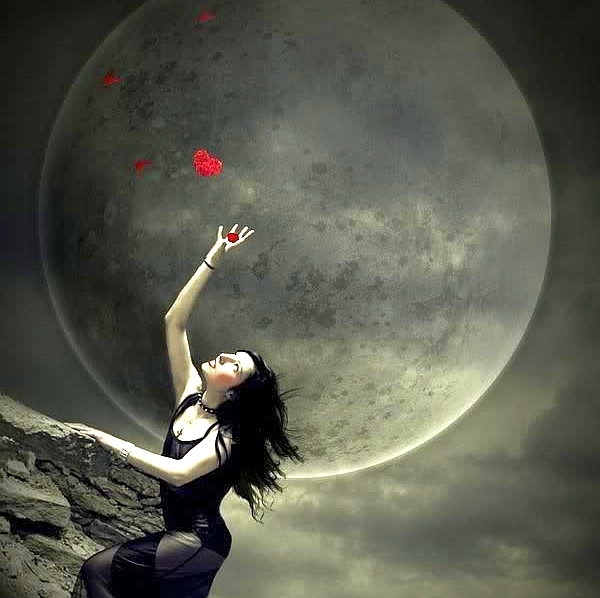 I am grateful for the spirit world, for the guidance. We don’t know the mechanics of this guidance and protection, but it does exist, and we will know more some day. Yes for me it is just to trust and sometimes I have a hard time with that. I am getting a lot better with that as time goes on. Who would have thought that such creativity could evolve from some many different takes on a single subject matter? Yet those various ‘takes’ are there to see in your wonderful photography, Inese. Art is such an important thing and it’s good to see it alive and well. Thank you so much Mike! Glad you like the angels. I haven’t taken, or even edited, any photographs lately, except for my family. I had no idea what I would post this weekend. Just waiting when this sad year goes away and hope for the better. How is your eye? I haven’t visited any blog these couple of weeks. Be good. The eye is 98% good. I feel it may stop at that. Not a problem though. How are you? Oh thanks goodness and hope it stays like that. Angels ~~ Beacon of Hope. Needed Worldwide but especially in the USA where we face troubled times. May God send Angels to save America. Thank you so much for the reblog!